If the 2016 presidential debates move forward as planned, voters have some clear preferences about what issues they want to hear the candidates talk about more – or less – in those forums. 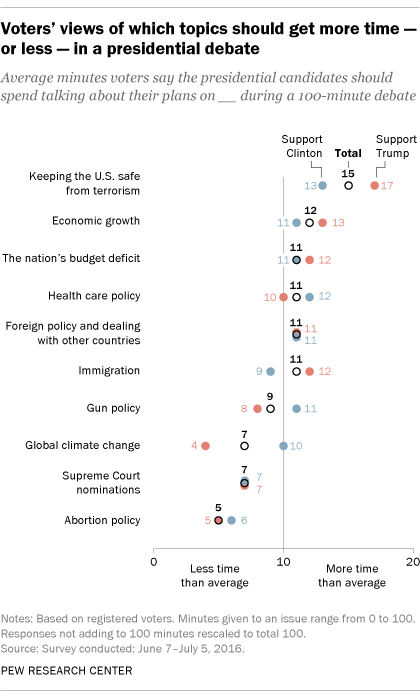 Given the chance to decide how much time is spent on each issue, voters would allocate more time to discussions of the candidates’ plans on keeping the U.S. safe from terrorism and on economic growth and much less time to discussion of abortion policy. Note: Full topline and methodology are available here.